Billy Irving, one of the "Chennai Six" detained in an Indian prison for four year, accuses the UK government of betrayal in an interview with The Scottish Mail on Sunday. He told the paper that he would have been freed much sooner if the Foreign and Commonwealth Office had "really engaged in our plight and fought for us". He felt "disgusted and betrayed", he added. 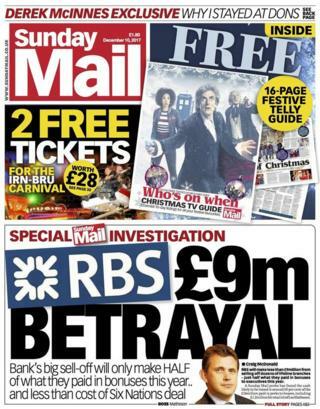 The Sunday Mail reports that RBS will make less than £9m from selling off 62 branches across Scotland. Its investigation found that the sum is half what will be paid out in executive bonuses this year. Heterosexual couples would be able to choose civil partnerships rather than marriage, under plans being considered by the SNP, according to a story on the front page of The Sunday Times Scotland. 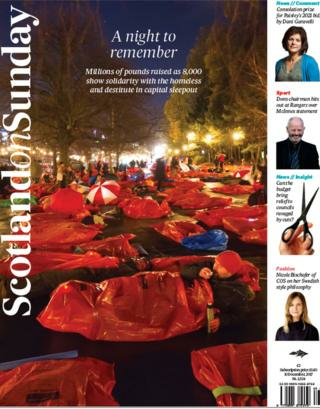 The Scotland on Sunday front page carries a large image of a "sleep-out" in Edinburgh, which saw about 8,000 people bed down in Princes Street Gardens in a "show of solidarity with the homeless and destitute". 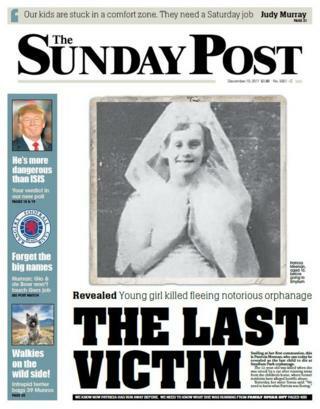 The last child to die at the Smyllum Park orphanage was 12-year-old Patricia Meenan, according to The Sunday Post. She was killed when she was hit by a car after running away from the children's home in 1969. 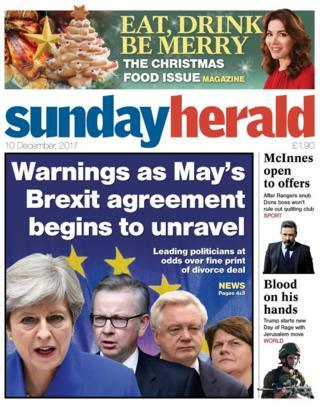 Meanwhile, the Sunday Herald reports that the Brexit deal "appears to be far from a final one". It said divisions were beginning to emerge between Tory Brexiteers and Remainers, with some calling the deal "a fudge".